Although a donkey's diet depends on his size and level of work, long ears don't require as much food as much as their horse relatives. They are classic equine "easy keepers." Most donkeys don't need grain unless they are in relatively hard work. Ask your vet about the feeding requirements for your particular donkey based on your property's forage quality and your animal's age and workload. Donkeys originated in arid parts of the world, such as the Middle East and Northern Africa. In those sparse landscapes, they browsed rather than grazed on lots of vegetation continuously. The donkey's body efficiently processes plants high in fiber, eaten in small amounts throughout the day. By instinct, he's constantly looking -- or scrounging -- for food. Most donkeys in the West don't have to do that, but that instinct can get them into trouble. 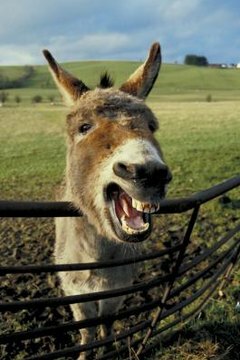 Avoid putting your donkey on rich pasture and don't feed treats. If your pastures are good quality, limit your donkey's access to just a few hours a day. Obesity-related diseases such as laminitis and other metabolic issues often occur in donkeys with too much access to good grass. If you notice your donkey developing a cresty neck, that's an indication of metabolic problems relating to diet and weight. Ideally, your donkey should score a five on the Henneke body condition score. Your vet can assess your donkey and give you management information. If your donkey is primarily a pet and receives minimal exercise, he'll probably get by on a basic maintenance diet. Donkeys come in four distinct sizes: mammoth, small standard, standard and miniature. Larger animals require more daily calories than the smaller donkeys. As with grass, donkeys shouldn't consume rich hays, such as alfalfa. They can eat oat or barley straw for fiber, along with timothy or grass hay with protein levels of about 5 percent. If you have a pasture of mid-range quality forage, you might not need to supplement your donkey's diet while grass is available. Donkeys should always have access to fresh, clean water. If your donkey works, he'll require more to eat. Depending on the level of work he does, you might want to supplement his diet with small amounts of commercial feed. Don't feed high protein feeds -- a basic 12 percent protein feed should suffice. Older donkeys might benefit from senior equine feed, especially if they suffer from dental issues. A hard-working donkey might consume 4 percent of his body weight in feed daily, but should be cut back gradually if his work load eases. The Donkey Sanctuary: What Should You Feed Your Donkeys? How Fast Do Foals Grow?